In the latest line of claims regarding the upcoming Apple iPhone 5, it has been said that the new device is going to feature the long speculated 4 inch display. However, the screen will be in taller and not wider which could naturally disturb the innate resolution settings of the iOS 6 in the latest device. But according to the reports that are going viral over the internet, the iOS 6 has UI features that are will allow for it to be stretched on devices having a bigger screen and that comes as a big positive for the Apple users. The same sources which had earlier leaked the information on the parts of the latest Apple device are also behind the current confirmation along with the iOS 6 SDK which is also hinting on the stretching feature. Early on Tuesday morning the 9to5 mac people came up with a fresh back trace on the iOS 6 SDK along with the iOS emulator that is providing for the iOS developers for making their apps compatible with the new version of iOS 6. The website has confirmed the news that the device is most likely to feature 640×1136 , as they have managed to hack some of the settings for making it run on the much speculated 4 inch display screen and simulated how the iOS 6 eta 4 or the later versions of the same will be appearing on the 4 inch display of the screen. With the fact that the iPhone 5 is going to come with iOS 6 pre-installed on it for its users, almost certain along with the change in the design of the device ; many people have been wondering how the things will actually appear on the big screen. As per the latest set of reports, the iOS 6 simulator runs correctly the iOS 6 beta version on the 4 inch screen hacked simulation mode and showing that the latest device will be having 5 rows on the home screen. This marks the Apple iPhone ditching the traditional home screen UI and adopting the latest stretchable UI from Apple. 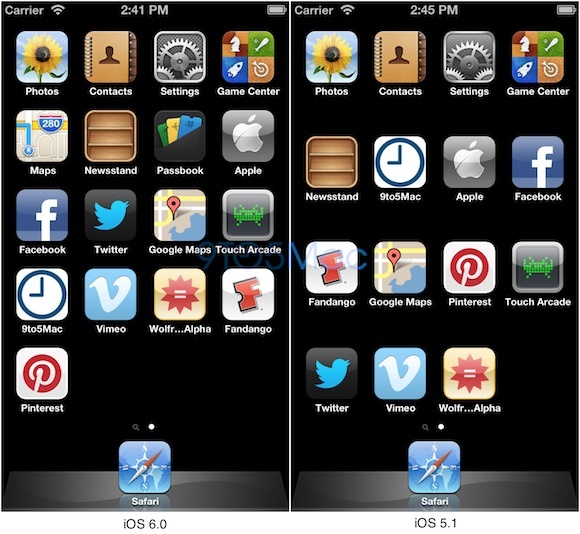 Both iOS 5.1 and 6.0 have bene compared into their hacked simulator which is powered for running the 4 inch display screen and have discovered that iOS 6 will be openly adopting the screen resolution and will have 5 rows on the screen . As compared to this iOS 5.1 has been unable to adapt this feature, and it shows only 4 rows on the home screen of the device. It is being anticipated that iOS 6 will be launched by Apple in September along with the launch of iPhone 5 in a media event, a couple of weeks before the actual release of the iPhone 5 in the markets. Apple iPhone 5 is simply the most awaited smartphone of the year. As pert latest reports, following a simulator run on the iOS 6, the Apple iPhone 5 will have a larger 4 inch display screen having 5 rows.